Implicit regression, Bivariate, Non-linear regression, Coefficient of variation, Model quality. Non-Response analysis uses ordinary least squares and maximum likelihood estimates to fit co-dependent variables in an implicit form including conic sections such as circles, ellipse, hyperbolas, and spheres, among other higher dimensional surfaces. This form includes lines, circles, ellipse, parabolas and hyperbolas [1,2]. To simulate an ellipse, consider the transformed space (u, v) such that in the first direction, the measure u moves linearly over time, either increasing or decreasing at a rate of 3 units per unit measure of time, and in the second direction, the measure moves along one of two curves, Further transformation of the (u, v) space to the (x, y) space by rotating the resulting ellipse 45° counterclockwise, letting Random error exists in both variables: with a sample of size 100, (Figure 1). This gives better point estimates then the single estimate, (Figure 2b). Figure 2: Scatter plot of full second-order model using standard regression; (a) using the entire data set and (b) partitioning the data based on the first developed model. Figure 3: Scatter plot of (a) full second-order interactive model using non-response analysis and (b) a comparison of non-response analysis (red) with the standard methods (blue). 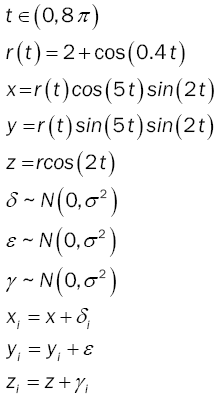 Where, Note: if a line as shown outside of the ellipse in Figure 3a. Compare this with the model full second-order model first for the data overall and using the partitioned data, (Figure 3b). Non-response analysis can also model in multi-dimensional space and is only restricted by the tractability of the variable measures . For a sphere with fixed center (h, k, l) and fixed radius r.
Just looking at the data, there is no apparent relationship other than the somewhat circular nature of the data (Figure 4). 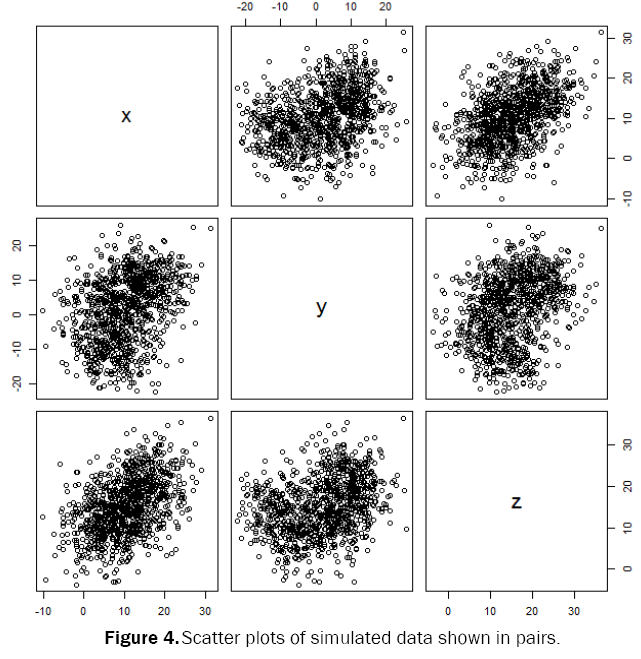 Figure 4: Scatter plots of simulated data shown in pairs. This mainly accounts for the central tendency and does not allow for higher order terms and interaction with the subject response (Figure 5). 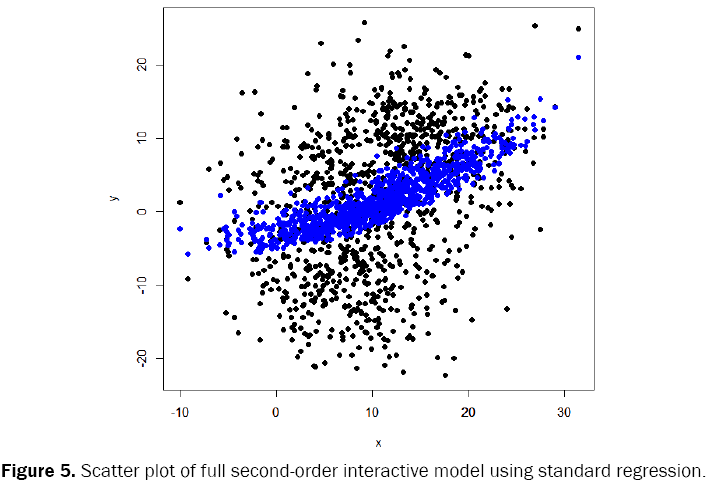 Figure 5: Scatter plot of full second-order interactive model using standard regression. 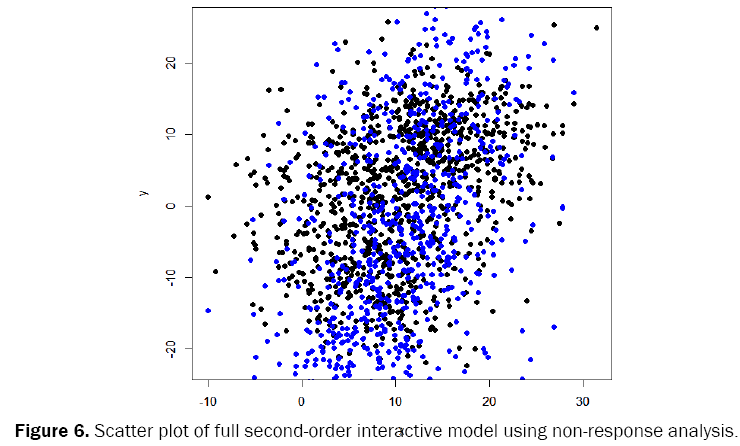 Figure 6: Scatter plot of full second-order interactive model using non-response analysis. Consider the space of a sphere which is transforming over time as the radius oscillates between one and three [4,5]. Let time be randomly observed over a period of 8π, and three measures be such that where r (t) is an unknown measure but is believe to change over time. For simulation purposes, the radius will be defined to be between one and three with a period of 5π. Furthermore, let each measured variable include random error that is normally distributed with expected value of zero and equal constant variance (Figures 7 and 8). 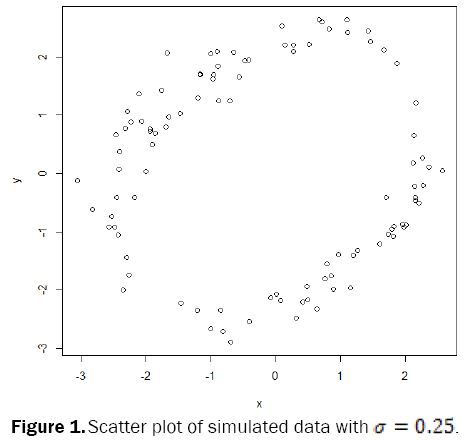 Figure 7: Scatterplot of relationship without random error and the observed values with random error. Figure 8: Line graph of measured variables. The coefficient of determination is approximately 0.7 which is a measure of the constant nature of the system and indicates that the constant that balances the system is highly variant with nearly a uniform distribution. Using the developed model to estimate unity (the constant the balances the system), we see the ossilation is more clearly defined, (Figure 9) and from which the frequency of ossilation can be determined in addition to the range. In this simulation the range is two. 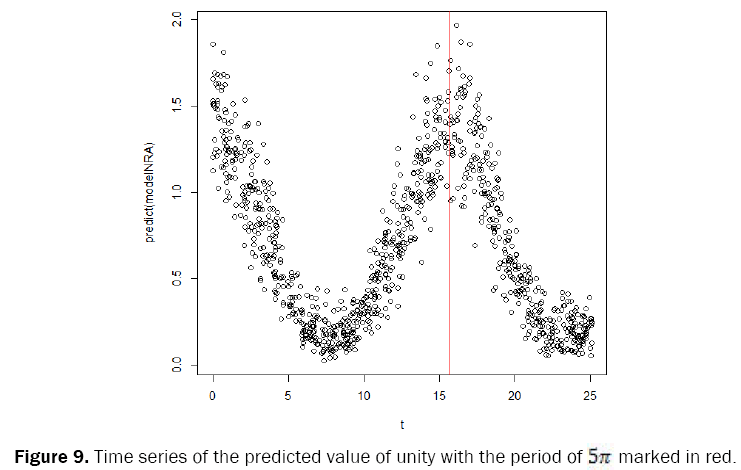 Figure 9: Time series of the predicted value of unity with the period of 5∏ marked in red. Using the developed model on average, we can estimate the mean radius using u, we have, In this simulation the radius was approximately two for each estimate of the radius. In this review, analysis shows that non-response model allows for information about unmeasured variables to be detected and with proper modeling, estimated. Hence, non-response analysis can measure the constant nature of a single variable; measure the balancing constant in a stable system and estimate the subject response in an evolving system. Wooten RD, et al. Implicit regression: Detecting constants and inverse relationships with bivariate random error. Cornell University Library, 2015. Wooten RD. Statistical analysis of the relationship between wind speed, pressure and temperature. Journal of Applied Sciences. 2011. Wooten RD and D'AndreaJ. Modeling hurricanes using principle component analysis in conjunction with non-response analysis. Cornell University Library. 2016. Wooten RD. An introduction to implicit regression: extending standard regression to rotational analysis and non-response analysis. Cornell University Library. 2016. Wooten RD. Lattice designs in standard and simple implicit multi-linear regression. Cornell University Library. 2016.